Following SK Telecom’s announcement on launching 5G smartphone service on April 3rd, there are continued interests around 5G service available in S Korea and details on actual coverage around the nation. Therefore, on April 12, 2019, SK Telecom has introduced its 5G network coverage map to further enhance customer convenience through transparent communication. With this 5G coverage map, customers can now check the 5G service availability in Korea at www.sktcoverage.com. SK Telecom’s 5G coverage map shows that the company’s 5G network currently covers most areas of Seoul. The size of Seoul is 233.7 square miles, which is close to that of Chicago (234 square miles), Illinois. The company has switched on its mobile 5G network on December 1, 2018, in selective areas of 13 cities including Seoul and six metropolitan cities, and has expanded its network coverage to main areas of 85 cities nationwide prior to launching its 5G smartphone service. The 5G network coverage map will be continuously updated as the company builds up more 5G base stations throughout the nation. In particular, it is expanding in-building coverage centered around 120 department stores, shopping malls and airports throughout the nation, and will expand 5G network coverage to nationwide subways, national parks and festival sites in the second half of 2019. We sincerely hope that this information will be useful for your future 5G-related reports. The ‘Slim’plan offers 8 GB of data (1 Mbps speeds after the data cap is reached) at KRW 55,000 ($48) per month and the ‘5GX Standard’ plan comes with 150 GB of data (5 Mbps speeds after data cap) at KRW 75,000 ($66) per month. Customers who subscribe to ‘5GX Prime’ (200 GB of data for $84 per month) or ‘5GX Platinum’ (300 GB of data for $110 per month) plans through the end of June 2019 will be able to use unlimited data without speed restrictions at KRW 89,000 ($78) and KRW 125,000 ($110) per month, respectively. Unlimited data will be provided on that promotional basis through the end of December, according to the operator. Just a few hours after the Qualcomm-Apple legal settlement was announced on April 16th, Intel Corporation said in a press release that it would exit the 5G smartphone modem business. The company plans to complete an assessment of the opportunities for 4G and 5G modems in PCs, internet of things devices and other data-centric devices. Intel will also continue to invest in its 5G network infrastructure business. Intel will continue to meet current customer commitments for its existing 4G-LTE smartphone modem product line, but does not expect to launch 5G modem products in the smartphone space, including those originally planned for launches in 2020. Intel said in the above referenced press release (also see References below) that it expects to provide additional details of its 5G strategy in its upcoming first-quarter 2019 earnings report and conference call, scheduled for April 25th. 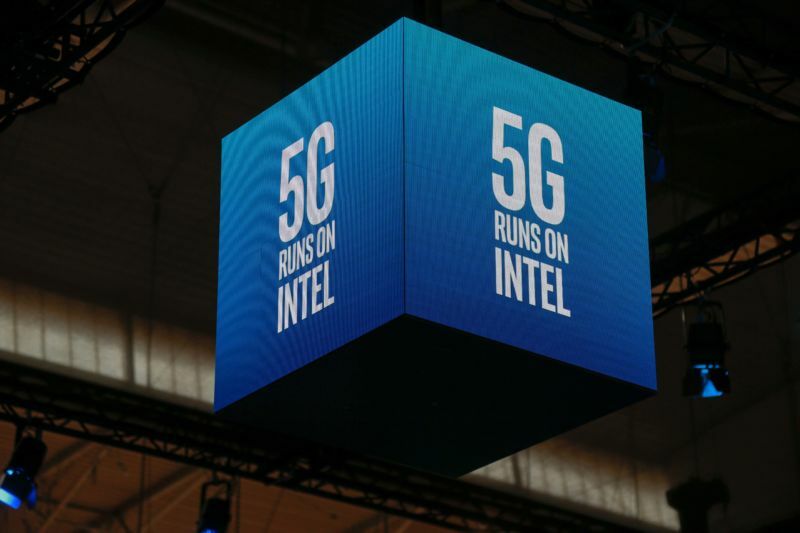 A 5G Intel logo was displayed at the Mobile World Congress on February 26, 2019 in Barcelona. In 2018, as Apple’s legal battle with Qualcomm heated up, Intel became Apple’s sole supplier for 4G-LTE wireless chips in the iPhone. Intel additionally was working to develop 5G chips for Apple to use in future versions of the iPhone. The company regularly participates in both 3GPP and ITU-R WP5D meetings directed at IMT 2020 (the ONLY 5G wireless/radio interface technology standard). However, recent reports have indicated that Intel was “missing deadlines” for the pre-standard 5G chip that was slated to go into the 2020 model of the iPhone. Note that Apple also participates in the ITU-R WP5D IMT 2020 standardization meetings. Fast Company reported earlier this month that “in order to deliver big numbers of those modems in time for a September 2020 iPhone launch, Intel needs to deliver sample parts to Apple by early summer of this year, and then deliver a finished modem design in early 2020.” That design would likely be based on 3GPP Release 15 NR, as Release 16 wont be completed till the spring of 2020. If Intel had failed to provide Apple with (pre-standard) 5G chips in a timely manner, that would have put Apple in an untenable position. The iPhone’s competitors would be able to offer 5G capabilities using Qualcomm chips, while Qualcomm could have denied Apple access to 5G chips as long as the patent battle continued. That’s over now, as Apple will surely use Qualcomm 5G chips in its future iPhones, iPads and other products. With Intel’s exit, there appears to be ONLY TWO 5G merchant semiconductor companies- Qualcomm and MediaTek. Huawei and Samsung are developing their own 5G silicon for use in their smartphones and base stations, but they are NOT likely to be sold on the open market to competitors. Finally, we don’t know how 5G can be a “strategic priority” at Intel when they have consistently failed to profit from the network equipment business after making billions of dollars of acquisitions in the late 1990s and early 2000s (e.g. WiMax, optical networking, Dialogic, etc). While Intel silicon is inside most IBM compatible PCs, they are NOT in hardly any smartphones or tablets, portable gaming machines, or other cellular connected equipment. Hence, we wonder how the 5G strategic priority will evolve into profitable products. The only “strategic priority” area we can come up with is Intel’s processors inside new wireless connected autonomous systems (e.g. remote controlled drones, industrial robots, self driving cars or other vehicles, etc) that uses Qualcomm 5G silicon. Wireless Autonomous Systems (WAS’s), which Intel Labs has been researching, will surely require ultra low latency and high reliability. Those capabilities are NOT in 3GPP Release 15 NR, but will be included in 3GPP Release 16 and the first IMT 2020 RIT standards that won’t be finished till the end of 2020. That implies the first 5G WAS’s products won’t be available till mid 2021 at the earliest. The Cignal AI Optical Customer Markets Report is issued quarterly and quantifies optical equipment sales to five key customer markets: incumbent, cloud and colo, wholesale, cable MSO, and enterprise and government. Findings from the current report – including market size, forecasts by regions and optical hardware vendor market share – will be examined via a webinar on Tuesday, April 23 at 11 a.m. EDT, which is open to all report clients. Cloud operators remain the fastest-growing segment – North American cloud operators spent nearly as much on optical hardware as incumbents such as AT&T and Verizon in Q4. New builds drove growth in EMEA, making cloud and colo the fastest-growing worldwide customer segment in 2018. Ciena extends market lead among cloud operators –Ciena supplied over a third of the global market and doubled its lead over its nearest competitor. Others in the top five include Cisco, Huawei, Nokia and Infinera. Incumbent spending growth will remain in low single digits through 2023 – While incumbents still purchase most optical hardware, their spending is static when compared with new network operators. Updated forecasts indicate a decline ahead in North American incumbent spending. 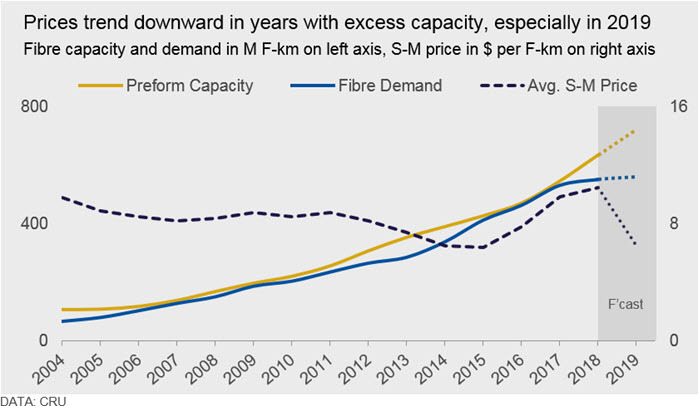 Cable/MSO and Wholesale Operators Decelerate Spending – Spending growth by cable/MSO operators was weak and market consolidation resulted in slowing wholesale optical network deployments. The 4Q18 Optical Customer Market Report includes current quarter and full year 2018 optical sales for all tracked vertical markets. The report also includes optical equipment vendor market share for sales to cloud and colo operators, as well as updated customer market forecasts through 2023. The Cignal AI Optical Customer Markets Report tracks optical equipment spending by end customer market type. It provides forecasts based on expected spending trends by regional basis. The report includes revenue-based market size for all end customer markets across all regions, with market share for sales to the cloud and colo segment broken out on a worldwide basis. Vendors examined include Adtran, ADVA, Ciena, Cisco, Cyan, ECI, Ekinops, Fiberhome, Fujitsu Networks, Huawei, Infinera, Juniper Networks, Mitsubishi Electric, MRV, NEC, Nokia, Padtec, TE Conn, Tejas Networks, Transmode, Xtera and ZTE. Quarterly report deliverables include an Excel file with complete data set, PowerPoint summary of highlights and Cignal AI Active Insight market event news briefs. Full report details, as well as free articles and presentations, are available on the Cignal AI website. AT&T’s Mike Zeto discussed the teleco and media company’s smart cities strategy as part of its 5G and IoT roll-out, saying in an interview AT&T will go beyond providing connectivity and focus on building “end-to-end solutions” for localities and enterprises. “The only way these cities are going to be move forward is with public-private partnerships,” Zeto said. In a press conference today in the White House’s Roosevelt Room, President Trump laid out a number of initiatives focused on helping accelerate the U.S. role in the 5G race. “This is, to me, the future,” Trump said, opening the press conference flanked by FCC Chairman Ajit Pai, Ivanka Trump and a room full of communications representatives in cowboy and hard hats. “5G will be as much as 100 times faster than the current 4G cellular networks. The race to 5G is on and America must win, It’s a race our great companies are now involved in,” Trump added. Trump said a secure 5G network will transform how everyone communicates and create astonishing new opportunities in America. “It will make American farms more productive, American manufacturing more competitive and American health care better and more accessible,” he said. “We cannot allowed any other country to out compete the United States in this power industry of the future,” Trump said. 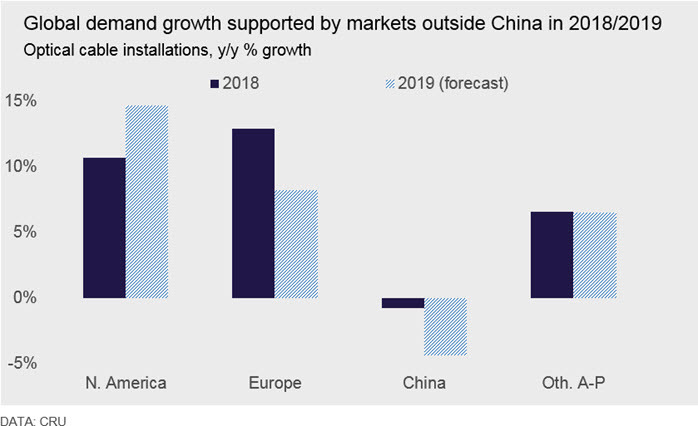 It’s important to note that China and the U.S. are fiercely competing in 5G adding to the tensions among the #1 and #2 global economies. In recent months both the administration and the FCC have been discussing ways to make America more competitive in the race to the soon-to-be-ubiquitous cellular technology. Earlier today, the FCC announced plans to hold the largest spectrum auction in U.S. history, offering up the bands to wireless carriers. The planned auction is set to commence on December 10th. As much as 3.4 gigahertz of “millimeter-wave” spectrum could be sold by the FCC to wireless carriers such as AT&T and Verizon in the spectrum sale, according to Pai. The focus is understandable, of course (AJW: really???). 5G’s value will go far beyond faster smartphones, providing connections for a wide range of IoT and smart technologies and potentially helping power things like robotics and autonomous vehicles. The technology will undeniably be a key economic driver, touching as of yet unseen portions of the U.S. workforce. Earlier today Pai and the FCC also proposed a $20.4 billion fund design to help connect rural areas. The chairman said the commission believes the fund could connect as many as four million small businesses and residences to high-speed Internet over the course of the next decade. The “Rural Digital Opportunity Fund” could launch later this year, after a period of public notice and comment. As the first commercial deployments of (pre-standard) 5G start to appear, the stage is set for consumers finally to find out what the powerful next-generation mobile standard promises can bring: an ambitious and far-reaching technological advance that transforms virtually all aspects of human activity—how we experience life, conduct business, create goods, and build societies. In its latest complimentary white paper, “The Promise and Potential of 5G,” business information provider IHS Markit explores the opportunities and challenges surrounding the upcoming global rollout of new 5G wireless networks. [1.] ITU considers 5G to be based on its forthcoming IMT 2020 recommendations. Those are the only official standards for 5G. According to the previously referenced IHS Markit 5G white paper, 5G will improve existing services and enable new use cases, such as driverless cars, immersive entertainment, zero-delay virtual reality, uninterrupted video and no-latency gaming. On the industrial front, 5G will be key to expanding and realizing the full promise of the internet of things (IoT), with the technology’s impact to be felt in smart homes, smart cities and smart industries. New 5G technical standards (i.e. IMT 2020 from ITU) will eventually enable the creation of applications that could open new opportunities, inform new business models and transform everyday life for multiple industries and billions of users throughout the world. However, many of these capabilities won’t be available in initial 5G rollouts, but instead will arrive in subsequent releases of the standard to be implemented over the next few years. Each of the releases will deliver new challenges and opportunities not only for the wireless industry but also every industry for which the new use cases are envisioned. To fully realize the potential of these opportunities, competitors will need to understand and capitalize on new capabilities even before they are fully introduced. In other 5G related news today…. The Ministry of Internal Affairs and Communications has approved the allocation of spectrum after determining that the companies’ applications met the conditions of the allocation, the Nikkei Asian Review reported. Japan’s telecom ministry has allocated 5G mobile spectrum to incumbent operators NTT Docomo, KDDI, and Softbank, as well as local e-commerce giant Rakuten. The four companies plan to invest heavily in 5G, spending a combined 1.6 trillion yen ($14.4 billion) over the next five years. Docomo is planning the largest spend, with goals to invest at least 795 billion yen in 5G over this time. The four Japanese wireless carriers plan to commence commercial 5G services in 2020, with KDDI and SoftBank planning to commence advertising for its services in March. Rakuten Mobile, Japan’s upcoming newest market entrant, plans to commence 4G services in October 2019 and 5G services in June 2020. The conditions for the allocation of spectrum included commitments to commence services in every prefecture of the nation within two years, and set up 5G base stations in at least half the country within five years. According to the report, Docomo and KDDI are each targeting more than 90% 5G population coverage by the end of the five years, while SoftBank is targeting 64% coverage while Rakuten is aiming for 56%. The Japanese government wants industry to build out 5G infrastructure widely, from big metropolitan areas to rural regions. It expects the technology, which offers speeds up to 100 times as fast as 4G, to enable self-driving buses and telemedicine, and to help Japan combat its worker shortage. The conditions required for receiving 5G spectrum included starting services in every prefecture within two years. The communications ministry also divided Japan into 4,500 blocks, requiring operators to set up base stations in at least half of them within five years. Docomo and KDDI each plan to achieve coverage of more than 90% in that time. SoftBank and Rakuten set less ambitious goals, at 64% and 56%, respectively. The requirement will force mobile operators to balance making heavy investments with attaining profits.